More than 50% of calories from carbs? So healthy are carbs? Are they the energy our body needs to function? No, no way. These are not the reasons we are recommended to base our diet on carbs. It is the unjustified fear of animal fat. In the middle of the last century in the U.S. some scientists believed that dietary fat was responsible for the increasing number of deaths from heart attacks. Despite the lack of scientific evidence to back up this belief, it was eventually imposed on all levels, with the participation of politicians, journalists and agricultural organizations. Any scientist who did not accept the new dogma was marginalized in funding of their research, ignored in the scientific literature, put away from public life or vilified. 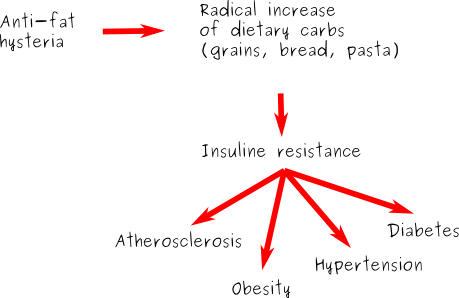 Fear of fat had an inevitable and devastating consequence: an increase of carbs in the diet. We need to eat and if it was not fat and we did not wanted to increase the amount of protein, then it was mandatory to increase carbs. What would be the effects of this change in the diet? It was not known at the time. There were no long-term studies analyzing the effect of this new way of eating. But that wasn’t an obstacle and they still subjected the U.S. (and world) population to an uncontrolled experiment, treating people as lab animals. This change in the diet was not possible without a facelift of carbs. My grandmother and also my mother were well aware that bread and pasta are fattening, but today’s mothers have been told the mantra that ” what matters are the total calories, not where they come from“. The current message is that fat, with more calories per gram than carbs, is the food to avoid. In short, the current dogma tells us that the problem with the sandwich is not the bread but the filling. The philosophy of counting calories is a direct result of the fear of fat: scientific knowledge is ignored, the physiological effects of different foods are ignored, and it all comes down to count how many calories each food has. To see the consequences of these dietary changes just look around us: diabetes, obesity, hypertension, cardiovascular disease, etc. And institutions are blind to the problem they have created: the obese are gluttonous and lazy, because they eat too much and move too little, low-fat low-calorie diets never work because nobody follows the guidelines and eat more fat than advised, etc..
nutrients, but excessive intake “. Ministry of Health . They are never wrong; the blame is to the people, who do not follow their advice and eat too much and get sick. May be the official recommendations are wrong? Of course not, it is because people have no self control! Hard to believe so much blindness and arrogance, right? I remember a co-worker asked me how it was that all public institutions in the world were wrong. Leaving aside the fact that not all countries recommend low-fat diets, we all should know the answer to that question and the book The Big Fat Surprise should be a mandatory reading in schools, universities and homes. But mostly, the authorities that make dietary guidelines and doctors should read it and internalize it. We all should know how we got to this situation, how some zealot and arrogant scientists were able to impose their beliefs over scientific evidence, how current dietary recommendations are based on non-existent, fraudulent or unreliability science, even when we speak of the famous Mediterranean diet. Even if we believe in the virtues of the Mediterranean diet, we should acknowledge that Nina Teicholz does a good job of analyzing the scientific evidence that backs it up. The book is entertaining and very clear in the description of the facts. In conclusion, the official dogma says that “the reduction of saturated fat and cholesterol are associated with decreased cardiovascular disease, particularly coronary heart disease, some cancers and obesity.” If you think that the authorities would not spread that message without having reliable data to back it up, you should read the book from Teicholz. Your health is at stake in this case and there is no prize for credulity. Rather the opposite. What If It’s All Been A Big Fat Lie? Is This Any Way to Lose Weight?